Echo is certainly envied for its position, sitting right on the Rosevill Marina with glorious views. It can be reached by short bushwalk from Babbage Road or a daunting series of steps from Normac Street. An inclinator can be used for stroller or wheelchair access via Normac Street. As I descended down the stairs, the glorious aroma of bacon, eggs and coffee certainly did a good job of making me hungrier. Echo shares the waterfront premises with the marina office. 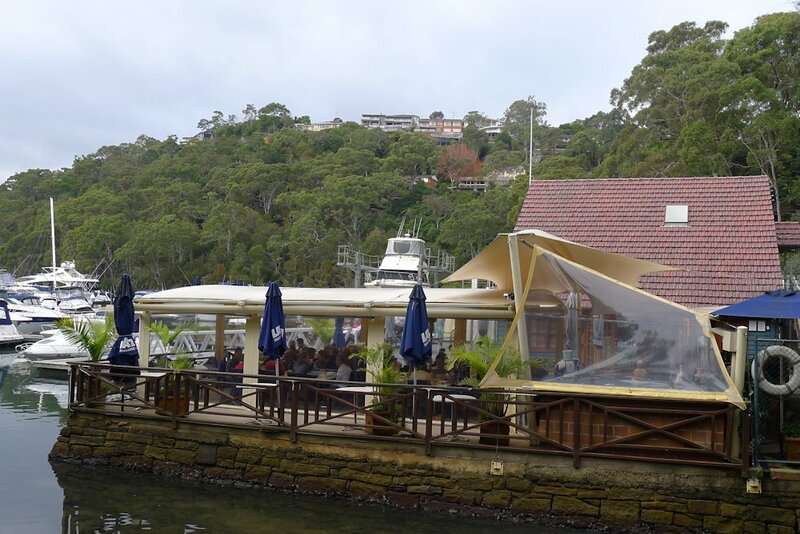 Their true outdoor tables (as opposed to those under cover) spread out onto the deck infront of the marina building. For special occasions or breakfast with a view, Echo has it all. Even on an autumn morning, the covered seating area had been enclosed and the heaters ensured that we were kept warm. If you intend to come on a weekend, booking is a must. Also be sure to bring AMEX or cash (no, I can’t explain why they don’t accept VISA/MC). 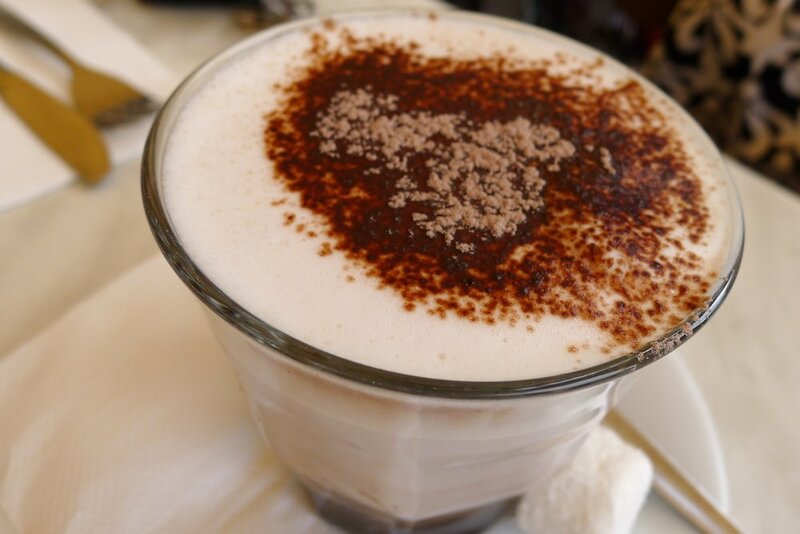 One of my guests enjoyed her hot chocolate ($5.50) and relished the fact that there was more chocolate at the bottom of the glass for her to stir up. While there was nothing outstanding about the drink, it was tasty and most importantly on a cold morning, hot. 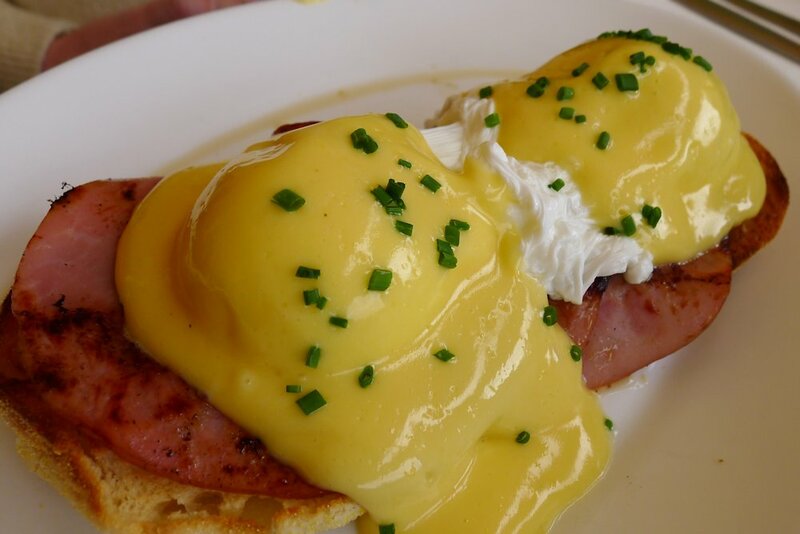 I had my eyes on one of the hollandaise breakfasts but when my friend, Ben, ordered the Benedict, I changed mine all for the sake of you SoS readers! At Echo you have the choice of ham (Benedict), smoked salmon (Atlantic although the menu refers to it as Benedict) or spinach (florentine). Surprisingly, all three are the same price, $17.20 which is unusual. The salmon normally costs more. Regardless, there was very little wrong with this dish. The hollandaise was a bit tangy as it should be and also a thicker consistency which helped it to bind the dish together better. Perfect runny poached eggs and slightly thicker ham top it off and the chives are a nice touch. For the sweet breakfast lovers, Echo has you covered. 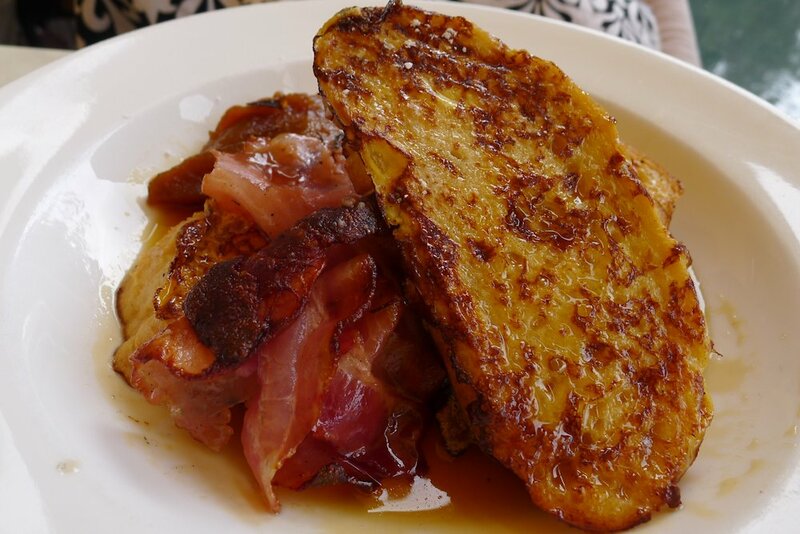 As well as toasted banana bread ($8.50), toasted muesli with poached pear, berry coulis and yoghurt ($13.90) or apple crepes with honeycomb butter and vanilla cream ($17.20) you can also enjoy the French toast ($16.20). Appearing on our table as the perfect example of “golden brown” this toast tastes as good as it looks. There was also an abundance of all ingredients promised. Two large slices of toast, a pile of thinly sliced gorgeous bacon and caramelised pear. It was all drenched with maple syrup and presented well. While my above combination of scrambled eggs ($16.90) and side orders of sausages ($6) and bacon ($5) added up to an expensive breakfast, it did taste fantastic. The sausages were also too good not to share so everyone benefitted! 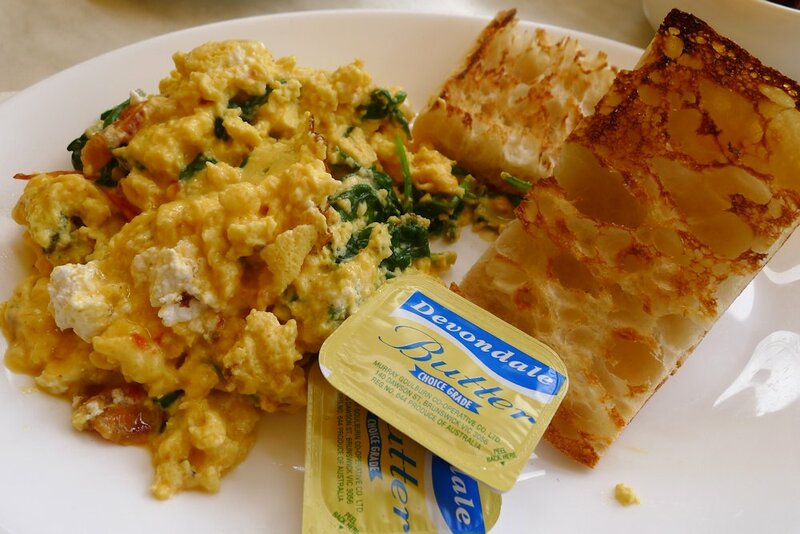 The scrambled eggs are prepared with feta, spinach and semi-dried tomatoes. 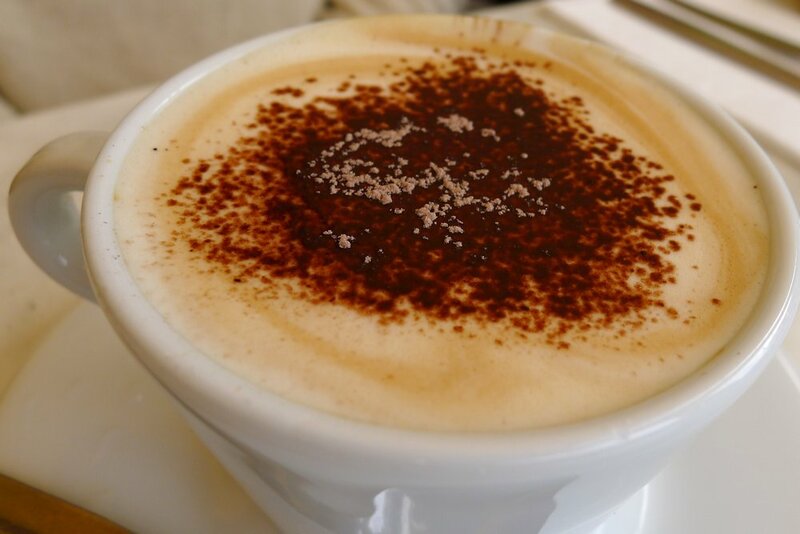 It has become a popular combination amongst Sydney cafés and it definitely works. I didn’t need to add any seasoning as it tasted great as it was. As mentioned, the sausages were great. 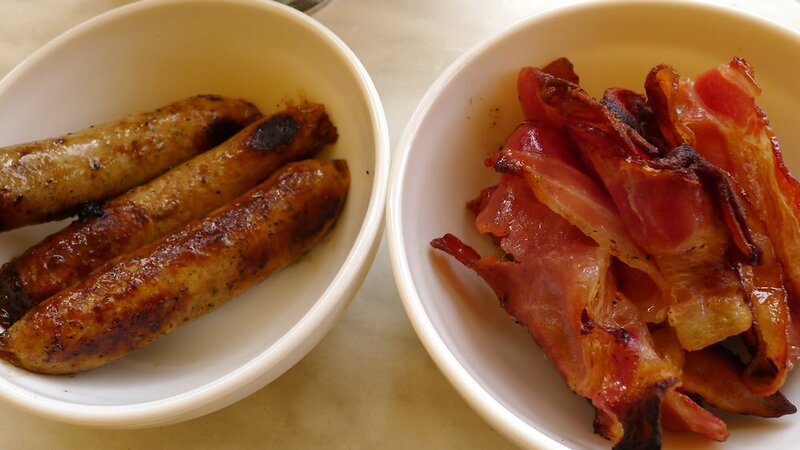 Breakfast sausages are often quite questionable but these pork examples with a slight spicy kick are worth it. Again, the thinly sliced bacon shone through with some crispy pieces thrown in for good measure. A very satisfying dish overall. While we found the service to be friendly, we have to say that visits to our table were infrequent. Our party was in no rush but we were waiting for about ten minutes for our menus and then another ten to order food. 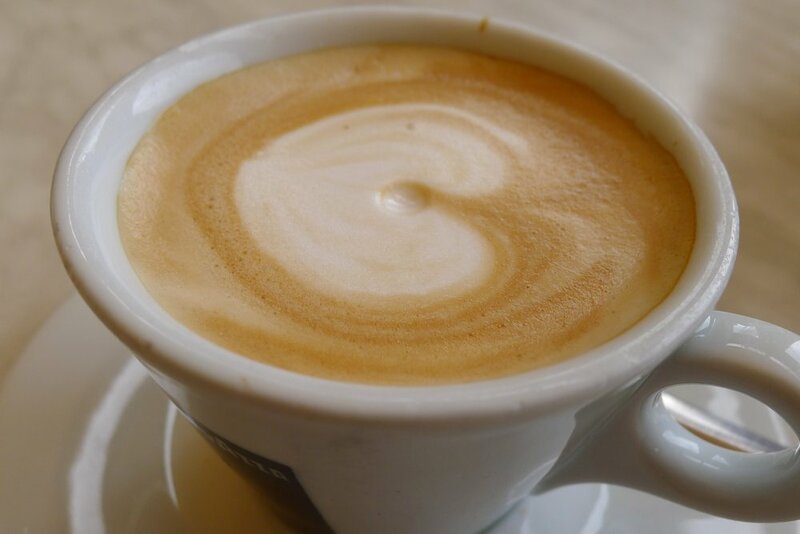 The coffees arrived with the food giving us little time to sit back and savour them before they got cold. Certainly not a deal-breaker though as Echo is worth the revisit. 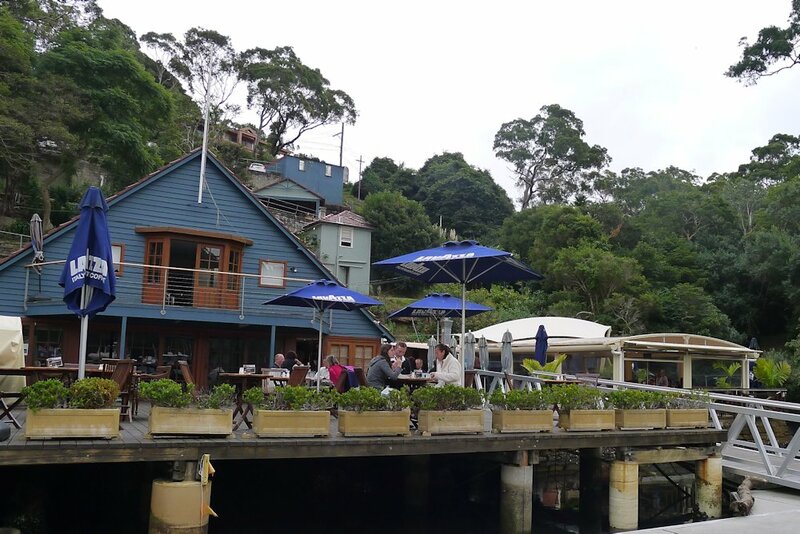 This entry was posted in Sydney - North Shore and tagged Disabled access, Dog friendly, Outdoor seating, Water views. Bookmark the permalink.